The United States Chess Federation has a web site called "In Passing," which recognizes and remembers USCF members who have passed on (see http://www.uschess.org/content/view/8047/35/). I know at least 100 on that list. Here are some obituaries of chess players I have known or played against. Buntin, Steven L. (Nov 5, 1950 - Jan 1, 2013) - Editor of the Carolina Gambit. I was a co-editor in the 1970s. He was rated a little over 1600. He lived in Chapel Hill, NC. He was also the editor of Kxe6s Verein, a chess periodical. I defeated him in 13 moves at the 1976 NC championship, held in Winston-Salem. Chance, John (Oct 5, 1930 - Sep 16, 1986) - Active member of the Tacoma Chess Club in the 1960s. He was rated around 1500. Couch, William B - He was an active chess player from North Carolina. I played a NC correspondence championship game with him and drew in 1977. He died in Conover, NC. Edmondson, Ed (Aug 13, 1920 — Oct 21, 1982) - Ed Edmondson was President of the USCF from 1963 to 1966, and Executive Director from 1966 to 1975. He was an Air Force navigator and retired as a Lt. Colonel. I met him at the 1977 U.S. Open in Columbus, Ohio. I beat him in a round of putt-putt golf during the tournament. Gray, Ronald (1934 — Dec 28, 1983) - Active North Carolina chess player from Raleigh. At one time, he played professional baseball. He was employed by the NC Department of Community Colleges. He was rated around 1800. He defeated me at the 1975 NC Amateur championship, held in Chapel Hill, NC. Howard, Chuck (Feb 28, 1933 — Dec 12, 2001 ) - President of the North Carolina Chess Association in 1975. He directed many chess tournaments in North Carolina, such as the Dogwood Festival tournaments in which I played in, held in Statesville. He lived in Lake Norman, NC. Menas, Borel (Feb 24, 1921 — Jul 27, 1998) - National master. In 1966, he won the Northern California chess championship. He was last active in the USCF in 1993. I have 1 win and 1 loss against him. Montakhab, Frank (Jun 22, 1938-Aug 18, 1988) - Active chess player in North Carolina in the 1970s. He lived in Mooresville and we played 19 games against each other in the mid 1970s. Powell, Charles (1945-1991) - In 1964, he beat Bobby Fischer in a simul in Richmond, Virginia. In 1968, PFC Charlie Powell won the 1968 US Armed Forces Chess Championship with the score of 11-1. 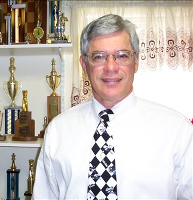 Virginia chess champion in 1964, 1965, 1966, 1967, 1971, 1972, and 1976. I have one loss against him, played at LERA in Sunnyvale in 1987. Rowan, Clifton (1917 — Oct 3, 2007) - Active Dayton Chess Club member and one of the early members, joining in 1959. He spent three years in the US Navy. He worked at the Liberal Market Distribution Center. He was rated around 1900. We played 23 tournament games against each other. Szarka, Frank J. - Editor of the Canadian Chess Chat. He was also the main organizer of the 1978 Canadian Open, held in Hamilton, Ontario. He won his class section in the 1975 World Class Championship, held in Vancouver, BC. After 5 rounds, Szarka and I were the only ones with a perfect score of 5-0. He then defeated me in round 6. He won with the score of 9.5-0.5. As White, he always played the Grob, 1.g4 and always won. He was originally from Yugoslavia and should have played in the master section. Watt, Billy (1959-1979) - High school chess player that was on the North Carolina State champion chess team at Alexander Central HS in Taylorsville, NC. I was his chess coach. He was later killed in a car accident. His father started the Billy Watt Memorial, which I was the first director in Statesville, NC. We played 18 games together.